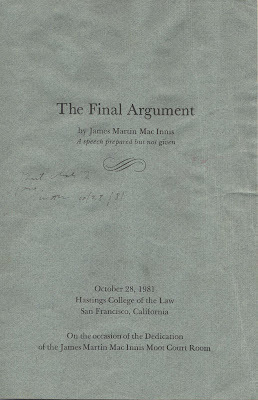 Sometime in early 1979 for reasons now lost in the passage of time the great San Francisco trial lawyer, James Martin MacInnis, drafted a set of rough notes for a speech on the art of final argument in the trial of causes before the courts. MacInnis was himself a master of final argument and knew whereof he wrote. Sadly, before he could complete his draft he was killed in an automobile accident at Gough and Pacific streets in San Francisco when a car driven by a drunken driver broadsided his car, killing him and his wife. The Bar of San Francisco mourned the loss of one of the greatest among them. MacInnis' notes in due course came into the hands of Bill Newsom, MacInnis' long-time friend, colleague, admirer and mimic (MacInnis once said to him, "Bill you tell this story, you do me better than I do myself."). Newsom took the notes and wrote the speech MacInnis had intended to write. He delivered it on MacInnis' behalf on the occasion of the dedication of the James Martin MacInnis Moot Court Room the Hastings College of the Law in San Francisco on October 21, 1981. James Martin MacInnis and I were first cousins through my father, Leslie and Jim's mother, Hazel, who were sister and brother. Jim's mother died young. As my parents were divorced, I didn't find out that I had cousins in California until I was grown and married when my Dad told me about Jim. I never did get to meet my cousin James as I lived on the East coast and he lived in California, but I am pretty certain that James knew about me. He was so much older than me, and I only wish that I could have met him and gotten to know him. In 1976 i prosecuted a death penalty cased against Jim's client Harry Harding. Mr. Harding was convicted. But those in the courtroom witnessed a truly great trial attorney in Jim MacInnis. We became great friends beyond the case, unfortunately for the short remainder of his life. As an alumnus I have had the occasion to visit the Moot Court Room at UC Hastings College of the Law. I always touch the bust of an old friend.